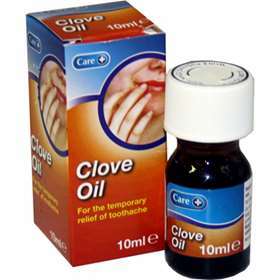 Care Clove Oil 10ml has a local anaesthetic and mild antiseptic effect and can be used to relieve toothache temporarily. Care Clove Oil is a yellow liquid which has a strong smell of cloves and can be used on both adults and children. The active ingredient of Care Clove Oil 10ml is clove oil 100%. There are no other ingredients. Apply a small amount to cotton wool and place on the affected tooth as required. Use with care on children under 2 years old. Apply Care Clove Oil only to the affected tooth. Do not use Care Clove Oil if you or your child have an allergy to Clove oil or eugenol. Do not use on surrounding gums. Consult your doctor or pharmacist if you or your child have blood that does not clot easily. Consult your doctor or pharmacist if you or you child are taking medicines to prevent blood clotting such as warfarin, as the anti-clotting effects could be increased by using Care Clove Oil. Do take clove oil during pregnancy unless your doctor has told you to do so. Avoid contact with the skin and gums. Repeated use may cause gum damage. See your dentist as as soon as possible.